This item can only be purchased if you live in the UK. We cannot ship overseas due to shipping regulations. This item can only be purchased if you live in the UK. We cannot send overseas due to shipping regulations. 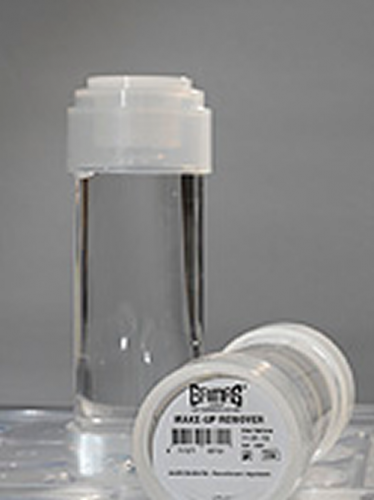 Grimas Mastix Remover is a remover for Mastix Extra; it also removes it from latex noses and sets. Mastix Remover is available in a 100 ml flask. Apply Mastix Remover to a cotton wool pad and then dab it onto the places that the glue is to be removed from. Cleanse the skin afterwards with Grimas Cleansing Lotion or similar. Hint: for a comfortable feeling, you can rub a skincare cream into the skin, for example Grimas Under Make-up Base or Skincare Cream. Mastix Remover is also used for cleaning brushes, which should then be rinsed off with water and shampoo. The ingredients / colorants used are indicated in their maximum percentage. Packaging: bottle = polyethylene, transparent, cap = polypropylene, transparent, contents = 100 ml. Toxicology: See safety declaration; judged according to guideline EEC/76/768. Contains alcohol. Alcohol is known to be able to cause vomiting, diarrhoea, impaired ability to react, dizziness, headaches and burns. Moreover, the risk for the unborn child is unclear. Dermatology: Frequently removing on the same area of skin can cause dehydration. Bacteriology: <50 CFU/G yeast and mould pathogens not present. Usable: = best before = months after opening. Storage: Store in a dry and dark place in properly closed packaging. Alcohol is a fire hazard. Do not use near open flame or sparks. Ventilate well. Do not smoke. Limitations: Limit use only to small areas of skin. Make-up on the skin: Take care of the skin after use. Make-up in the eyes: Irritating to the eyes. Rinse at length with water and consult an ophthalmologist. Instructions for use: see product information and conditions of delivery.